Sometimes it's the simplicity of the game that makes it popular. Yahoo! Games, for example, has a lot of shoot 'em ups, typing, and matching games that are so easy and yet so addictive. I should know; I have seen some officemates who immediately switch to these games after the office hours are done. 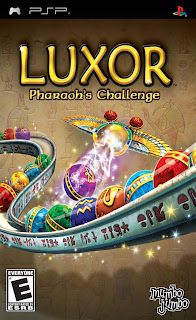 Luxor follows along the lines of simplistic yet addictive gameplay. The rules are really quite simple: shoot colored balls into a moving caravan of these and try to match at least three like-colored balls to eliminate these. Exterminate the line being pushed by a scarab before it can enter the cavern at the end of the path. The scarabs are a dead giveaway in the game's theme: Egyptian of the ancient kind. If you choose the Adventure mode, the game spins a story about a lady who died and whose soul was about to be weighed against a feather. Actually, I'm not sure how the game correlates with the story at all, so I skipped most of the narration (tee-hee!). The animation is great, the sound effects and music match the game nicely. Along the way, you get blessings that aid you in conquering the levels. However, you can only activate three blessings at a time. The PC version is a lot cooler graphics-wise but the portability of the PSP version is a winner. Luxor saved me from a lot of boredom during times when I am in a queue in the bank or having my papers processed.